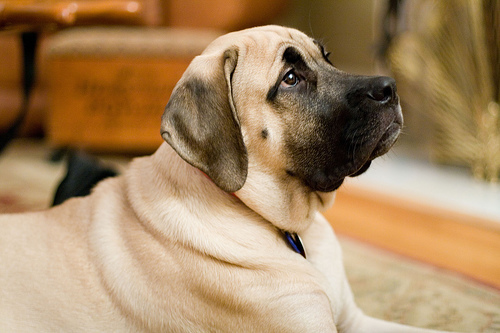 Photo of an extremely cute English Mastiff by Ocean Yamaha/Flickr. I went shopping for a vacuum recently, and it seems that every vacuum in the world, in one way or another, is ideally equipped for picking up pet hair. (Apparently all marketers got the same memo.) This "benefit" appealed to me because I figured the same capability might help with my specific challenge: daughter hair. But whether you have dogs or daughters, hair is an easily solved problem. Dog pee is another matter. I didn't happen to see any vacuums that advertised "Best for pet urine," at least not any standard vacuums. While deep-cleaning vacuums do more for removing dog pee than regular models, a professional cleaning is the best way to restore your carpet. You'll want to find — and be willing to pay for — a good carpet pro, and between cleanings do what you can to minimize damage (and odor) from dog accidents. Why Dog Pee Is So Smelly and Destructive? Dog pee itself smells bad because it's pee, of course, and you'd have to ask a higher authority why that is so. Over time, dog pee smells worse due to bacteria growth. Yet the offenses of pee aren't just olfactory. Being liquid, urine quickly saturates the carpet fibers and soaks through the backing and onto the carpet pad below. Standard pad lets the liquid through to the hard flooring or subfloor beneath. Unfortunately, many subfloors are made of extra-absorbent materials, like particleboard and OSB. Even if you eliminate the stain on the carpet fibers, dried urine in any one of the these layers can create odors for years, often during hot and humid weather (just making sure you're at least somewhat grossed out by this article). If a carpet lies over wood flooring, pee stains—and odors—can be permanent. Permanent means permanent. Your primary goal is to remove as much urine from the carpet A.S.A.P. The best tool for this is a handheld carpet cleaner designed for extracting liquids (they cost only about $50, so this is an excellent "accessory" to purchase along with a new puppy or rescue dog). If you don't have a carpet cleaner, you might be tempted to use a wet/dry shop vac; this may extract the liquid pretty well, but then that pee will be dispersed and filtered throughout the vacuum—not a fun thing to clean. Don't use a regular vacuum, lest your house smell like urine every time you fire up the machine in the future. Blotting is an age-old, though not terribly effective, method: Lay down a stack of paper towels or cloth rags and step on it. You might also walk on it with desperate little mincing steps. Repeat until the towel comes up dry. The problem with blotting is that it forces some of the pee deeper into the carpet and pad (think of running water over the surface of a dried sponge, then squeezing the sponge to distribute the liquid). After the extraction process, apply a bio-enzymatic cleaner made for dog pee, and follow the product directions. Alternatively, you can try a homespun cleaning regimen, typically involving vinegar and water, dish soap, baking soda and hydrogen peroxide, but these are more likely to mask the odor, and peroxide can bleach some carpets. If the pee has already dried, use a bio-enzymatic cleaner as directed. Find a company that performs an in-home inspection before recommending cleaning treatments and submitting a price quote. Avoid companies with by-the-room estimates and rock-bottom rates. During the inspection, talk to the technician about the dog pee problem and point out the affected areas. While standard carpet cleaning typically includes ordinary stain removal, urine stains often call for extra treatment and charges. The cleaner should have a specific, detailed plan for dealing with pet urine. Be aware that extensive pee problems may require pulling up the carpet and treating the subflooring, walls and any other affected elements, in addition to the carpet and pad.